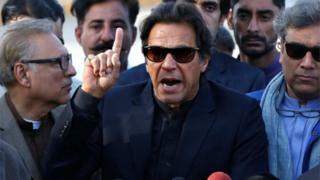 Pakistan's Supreme Court has cleared opposition politician Imran Khan of failing to declare his assets. The former cricketer could have been banned from parliament. However, the secretary general of his PTI party, Jahangir Tareen was disqualified. Both men were accused of concealing details of some of their properties and income when entering politics. The court ruled that Mr Tareen had not been "honest" in failing to declare property he owned in the UK. The party will also face an investigation by the Election Commission into allegations it illegally received money from foreign nationals. In July the Supreme Court disqualified then Prime Minister Nawaz Sharif following an inquiry into his family's finances that Imran Khan had pressed for. Both cases came after revelations which emerged in the so-called Panama Papers.